Puerto Vallarta is one of Mexico's cultural hot spots. In addition to its amazing international art galleries, year-round cultural events, and excellent boutique shopping, the city has one of Mexico's most diverse list of restaurants ranging from your typical inexpensive Mexican taquerias to world-class fine dining restaurants featuring French and Spanish cuisine. There is something for everyone in Puerto Vallarta and, due to the sheer number of excellent options to choose from, make sure to do some research on Vallarta restaurants to make sure to have a taste at some of the city's best. Here are some of our recommendations. 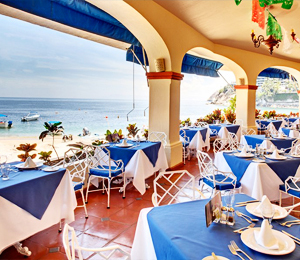 Las Palomas is one of the best Puerto Vallarta restaurants for people watching. It truly encapsulates the essence of Puerto Vallarta and the Pacific coastline of Mexico in its menu, decor, and all-around vibe. The restaurant offers great views of the ocean-front malecon boardwalk filled at any hour of the day with tourists and locals alike taking a stroll and enjoying the warm Vallarta day. The restaurant's menu features authentic and classic Mexican dishes such as chicken enchiladas with mole sauce and Mexican nachos with beef, beans and cheese. An excellent way to spend a balmy Puerto Vallarta afternoon is on the upper open-air deck at one of Vallarta's best restaurants, Barcelona Tapas! This restaurant offers delicious and authentically-concocted tapas in the Spanish tradition, served in generous portions and alongside flavorful pitchers of sangria. They also serve the national dish of Spain, paella, and tasty vegetarian dishes for the non-meat eaters. The views of downtown Puerto Vallarta from the Barcelona Tapas restaurants create the ideal atmosphere for an unforgettable dining experience. For a world-class fine dining experience in the heart of Old Town Puerto Vallarta, head over to the famous Cafe des Artistes. Going to the Cafe des Artistes is an experience, complete with French cuisine prepared by chef Thierry Blouet, a cigar and cognac bar, a wine bar, and live jazz and blues music on most nights. The Cafe is definitely one of the more higher-end restaurants in Downtown Vallarta, but it is also the most widely accredited and respected, and most people will tell you that the experience of dining at the Cafe des Artistes is worth every dollar. Living up to Vallarta's reputation as a world-class city, restaurants like Hacienda Alemana offer cuisine from all over the world. Hacienda offers Vallarta visitors looking for something other than the usual seafood/Mexican dishes a taste of something new. The restaurant features classic Bavarian dishes such as fried onions, schnitzel, and feal bratwurst. They also have a great buffet on Wednesdays and Saturdays.